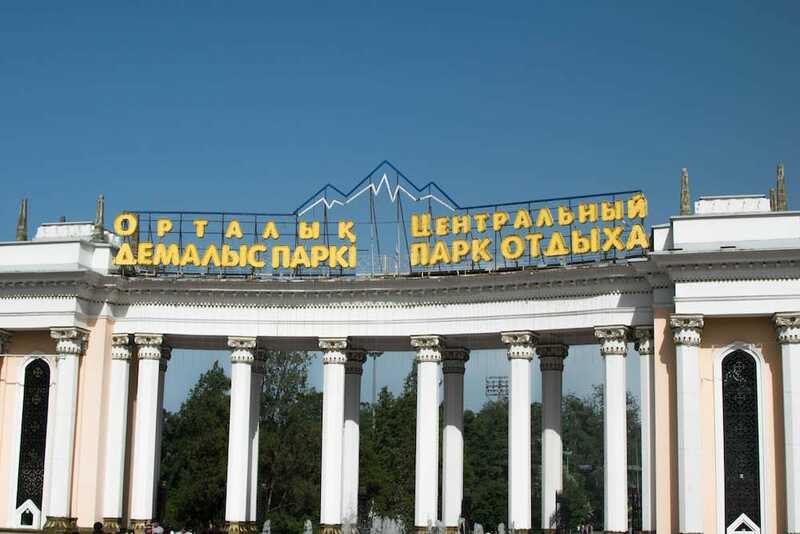 20 Things to do in Almaty, from fun day trips to museums in the city! We spent most of our time in Kazakhstan in Almaty, the former capital and largest city in the country. Mostly because it’s Kazakhstan’s main transport hub, a center of many great sights and must sees. It was easy for us to travel from here to most places we wanted to see in Kazakhstan. To be honest, our first impression of Almaty was that of bit moody place with lots of Soviet Union style buildings. However, during our second visit in Almaty, we found out that it’s actually a really cool, modern city with lots of fun sights, bars, cafes and restaurants. It feels more like an European city than Asian city, which means it’s a pretty comfortable place. We ended up doing plenty of fun activities here. 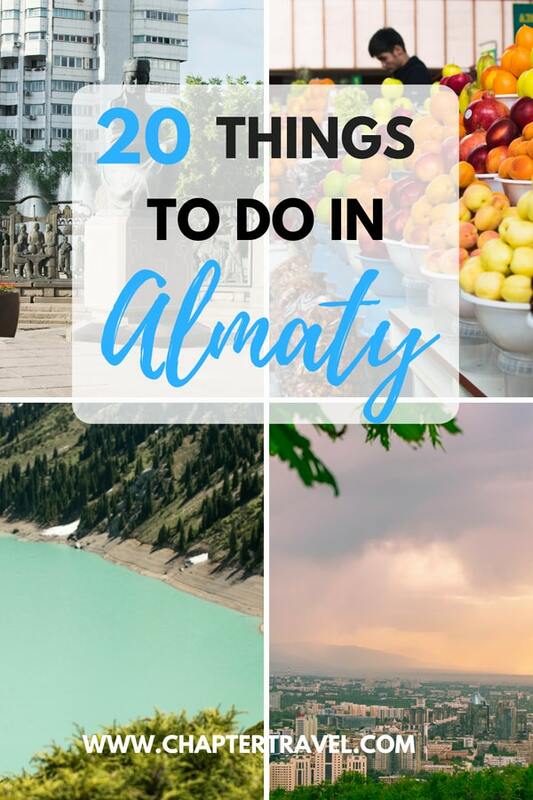 For this article I’ve also done quite some research… So I now present to you a list of 20 things to do in Almaty. Enjoy! Be sure to check out our Two week itinerary for Kazakhstan! The Green Market in Almaty is a large, two-level traditional market. 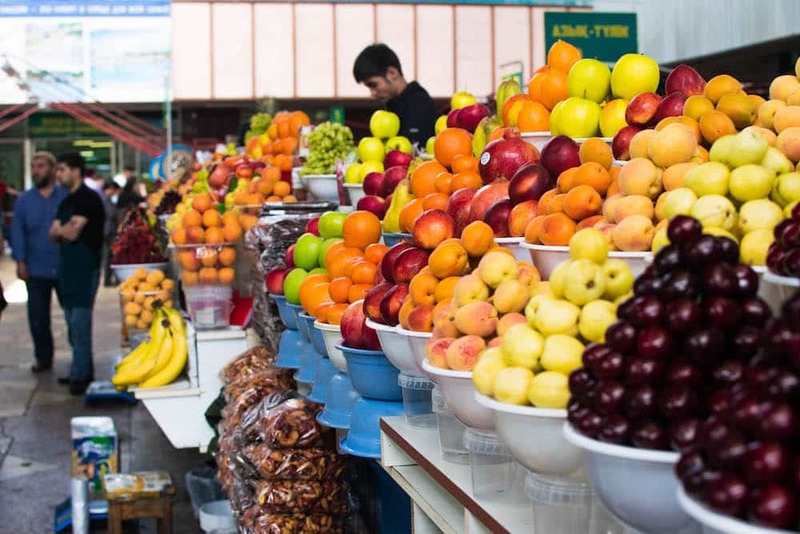 At this market you’ll finally feel like you’re in Central Asia, and you can browse around all the different products. At the various stalls you can find nuts, spices, fish and meat. But also fermented horse- and camel’s milk, or perhaps a bit more to your taste: freshly squeezed pomegranate juice. We also encountered lots of fashion items, such as clothes, bags and traditional slippers. 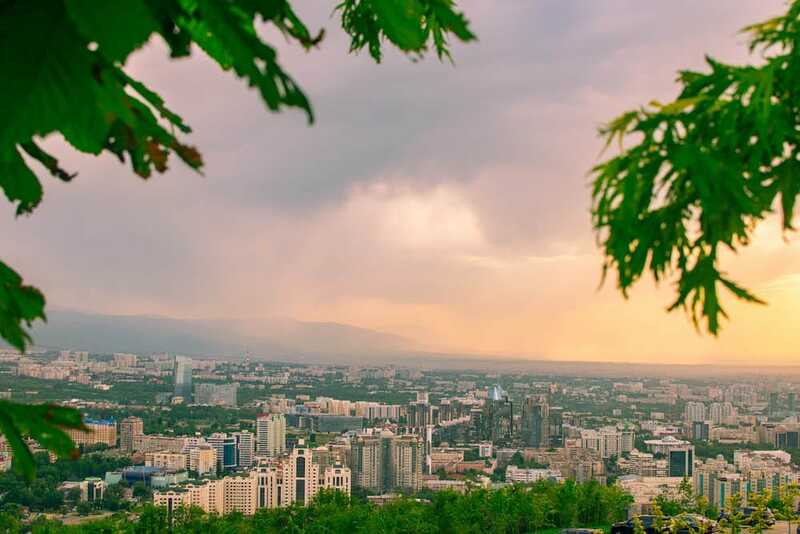 If you need some relaxing after travelling or camping around Central Asia, then Almaty is the right place for it. In the center of the city, near Panfilov Park, you can find the Arasan baths. The Arasan Baths are considered to be one of the best bathhouses in Central Asia. In this modernistic Soviet style building you can find amazing facilities, where you can get a traditional bathhouse experience. It’s possible to choose from Russian banya, Finnish sauna, Turkish steam baths and Moroccan hammam. There are separate sections for both men and women: women on the left and men on the right. 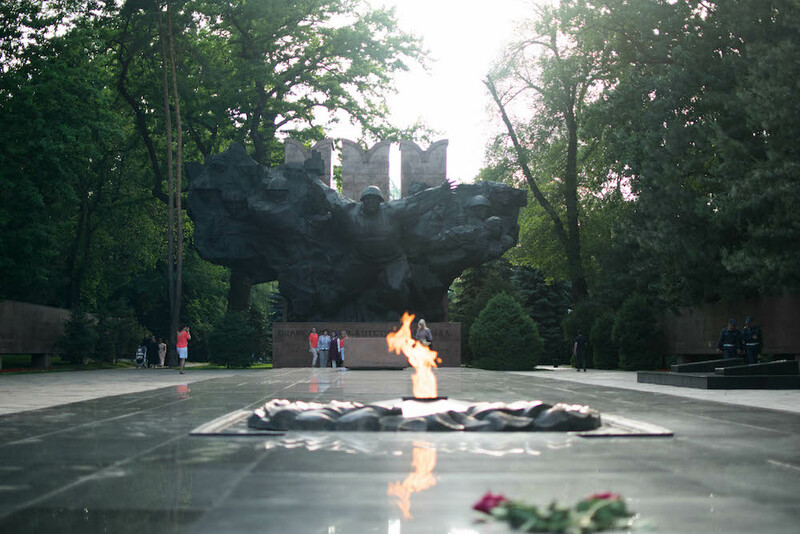 Stroll around this green park in the center of Almaty and find the fearsome war memorial. The park is named for the Panfilov Heroes, 28 soldiers of an Almaty infantry unit who died fighting in a village outside of Moscow during World War II. The gigantic war memorial depicts soldiers from all 15 Soviet republics coming out of a map of the USSR. In front of the memorial you can find an eternal flame honouring the fallen of the Civil War and the World War II. At the heart of Panfilov Park you can visit the colourful Zenkov Cathedral, also known as Ascension Cathedral. The cathedral is one of Almaty’s few surviving tsarist-era buildings. Completely built entirely of wood, the cathedral was designed by AP Zenkov in 1904 and is still a functioning Russian Orthodox Church. Located at Panfilov Park, this impressive wooden building was built in 1908, at the same time as Zenkov Cathedral. Here you can can see and hear a fine collection of traditional Kazakh instruments, such as bagpipes, wooden harps and horns, but it’s also possible to take a class to play one of these instruments. At this large ceremonial square you can get a beautiful view of the snowcapped mountains that surround Almaty. From here you can also see the neoclassical-style Maslikhat building and the Presidential Residence. 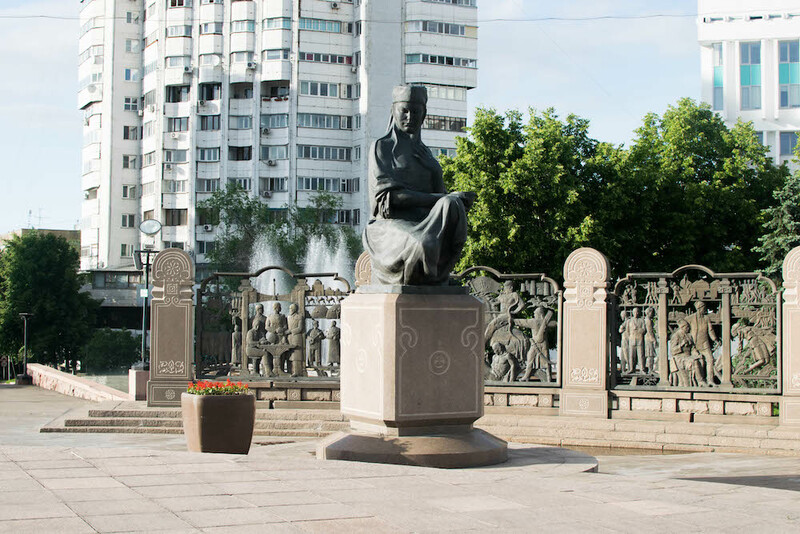 At Respublika Alany there are a lot of monuments, such as the Independence Monument in the middle of the square. Around the Independence Monument there are statues of a Kazakh family, and a wall that depicts scenes from Kazakhstan’s history. The Central Mosque in Almaty is a beautiful white-marble building with gold domes. It’s one of the largest mosques in Kazakhstan with space for 3000 worshippers in the main prayer hall. The Central Mosque can be visited daily except on Friday. Women need to cover their heads, arms and legs. 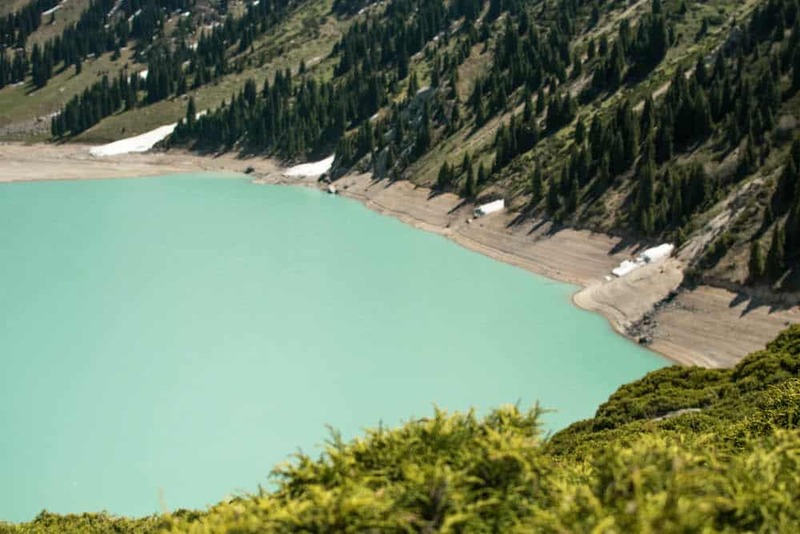 Big Almaty Lake can be reached by car, bus (bus 28), mountain bike or by foot. By car it’s only 30-40 minutes, so we choose that option. The lake sits at 2500 meters above sea level in the Big Almaty Gorge. What makes this lake special is that the colour changes depending on the weather and the time of year. During our visit the lake had a deep turquoise colour, but it can also have an emerald green hue. The surrounding forest makes it even more spectacular. This is considered to be the best museum in Almaty and is located 300 meter up Furmanov from Respublika Alany. 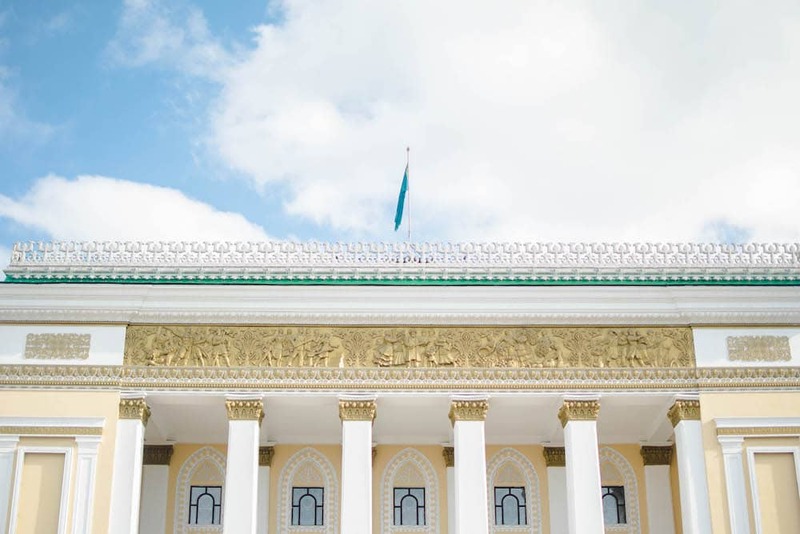 The Central State museum takes you through Kazakhstan’s history from the Bronze Age to 1997, when Almaty was no longer capital. Central Gorky Park is Almaty’s biggest recreational park. There is something for everyone, as here you can go to the cinema, funfair, aqua park or sit down at one of the cafés to relax. There is a pedestrian zone at Zhibek Zholy Avenue, also known as Arbat. It’s the main shopping street of Almaty! Here you can find lots of cheap cafes, restaurants art stands, art galleries and the occasional street performer. The Kok-Tobe is a 1100 meter high hill that can be reached by cable car. Once you are up there, you’ll be a bit surprised by what you find… Besides lots of cafes, restaurants and shops, there is a children’s playground, statues of the Beatles, a rollercoaster and more… kinda random stuff. There are also people that will try to get you to pose with animals; we saw a big falcon, little bunny and snake (please don’t do that, those animals shouldn’t be locked up for tourism). Who would’ve known that you can shop quite well in Kazakhstan? Once you know Almaty a bit better, it’s not a surprise, as it’s really a very modern city. There seem to be countless malls in Almaty. One we personally visited frequently is the Dostyk Plaza, mostly for the food court on the third floor (which nearly every mall has). The Dostyk Plaza has most of the stores that you can also find in Western Europe, such as the Zara, H&M, Bershka, but also more high end fashion stores, toy stores and much more. In this pastel yellow-painted classical Italianate architecture lays the State Opera House. You can visit the Abay Opera House for different kind of performances, from ballets and classical music concerts to modern dance performances. Tickets cost from 400-2,000 KZT and performances often begin at 6.30pm. Located 30-40 minutes from Almaty by car, Aksay Gorge is a beautiful location where you can visit a Orthodox monastic monastery, which was built in memory of the martyred priests Seraphim and Feognost. A few monks live at this monastery. Aksay Gorge had a huge landfall in 1887 due to the Vernensky earthquake. This earthquake didn’t only destroyed the city, but mountains too. The main botanical garden of the Academy of Sciences of the Republic of Kazakhstan covers an area of 108 hectares and has a length of approximately 2 kilometer. In this botanic garden you can find an open spice with pine groves, and a big variety of roses, tulips, lilacs and more. Furthermore, the botanical garden features a Japanese garden, lotus ponds, and a greenhouse with cacti and tropical plants. Our airbnb host took us and a whole group to a very cool bar and club in Almaty. At this two-level building there was a hip bar on the first floor, with really fancy drinks and a fantastic atmosphere. 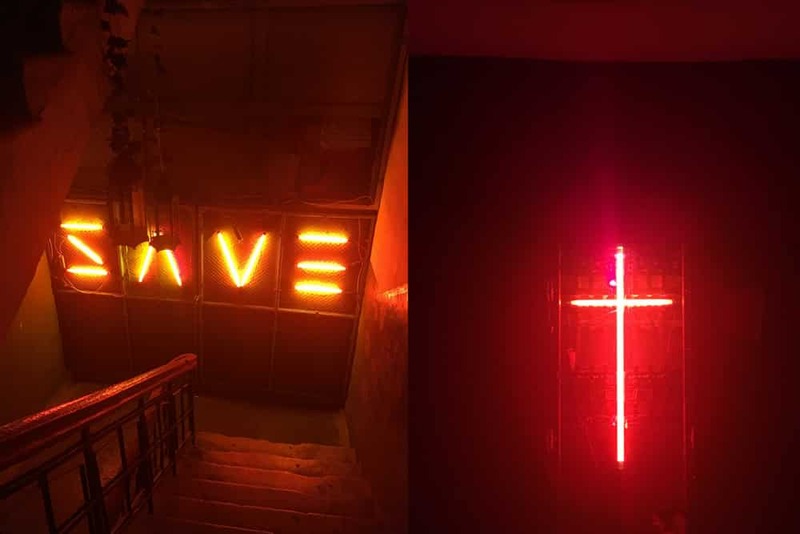 The second level is were you can find the club (see photos above), where there was techno music and a dark, moody interior. It’s located in an old tobacco factory and there are lots of smaller rooms with interesting objects and artworks. Unfortunately I couldn’t find the bar and club online, as it is a bit of a “secret” bar, which of course adds to the experience. However, I asked my Airbnb host for the address, which is Valikhanova 27. Hope you find it! Almaty has a buzzing nightlife and according to some of the locals we met, Chukotka is one of the best clubs of the city. Located in the middle of Panfilov Park, this two-level club offers live bands from 21.00 and from midnight the party really starts going with DJs spinning house, soul, hiphop. During our trip we’ve been here twice and found the crowd to be very welcoming, open-minded and fashionable. The entrance to the club is free and drinks are cheap! Another interesting museum in Almaty is the Museum of Arts. Here you can explore the best art collection in Kazakhstan, with Kazakh, Russian and Western-European art. Furthermore, there is a room of top-class modern Kazakh handicrafts. Personally, I do not eat meat myself, which is actually quite difficult in Kazakhstan because every dish contains meat, but if you eat meat you can try Beshbarmak. Navat in Almaty is a traditonal Kazakh restaurant where you can try Beshbarmak. This traditional dish is usually served in a big round bowl and usually includes mutton broth and comes with a sort of pasta dough. The dough is cut into squares and boiled in the broth. The term Beshbarmak means “five fingers”, because nomads used to eat this meal with their hands. Navat is a perfect restaurant to try this traditional meal, as the restaurant has a nice interior and we read good feedback about the staff. Be sure to book in advance or come on time, as when we visited the restaurant was completely full. Do you have any questions? Feel free to use the comment section below for any questions, comments, or perhaps you have any tips for Almaty you would like to share! Hey if you don’t eat meat, you should have gone to these places! We found your article very informative an useful. We’re in Bishkek at the moment about to embark on a 3 week trip around Kazakhstan! We’ll be sure to read your other articles to get tips on other places too. I’d love to visit Kazakhstan one day and appreciate this list of things to do while in Almaty. Would love to check out the botanical gardens and the lake area. I’ve never really put Kazakhstan on my travel itinerary, but this looks beautiful and makes me want to visit!